In order to properly treat dry eye, our doctors must first determine the root cause of your condition. Meibomian Gland Dysfunction (MGD) accounts for 86% of dry eye caused by a blocked tear duct (Evaporative Dry Eye). Products like RESTASIS® do not treat Evaporative Dry Eye. Luckily there is an FDA-approved device that can safely and effectively provide relief: LipiFlow® Thermal Pulsation System. Mosaddegh Eye Institute is proud to offer our dry eye patients the revolutionary LipiFlow treatment in San Francisco. Created by TearScience®, LipiFlow was shown to improve Evaporative Dry Eye symptoms in 79% of patients within four weeks of treatment. With LipiFlow technology, it is possible to directly treat the root cause of MGD. The LipiFlow Thermal Pulsation System unblocks the eyelid glands, allowing them to resume production of complex natural oils. The treatment includes the application of precisely-controlled heat to the inner eyelid. The single-use activator applies adaptive pressure to stimulate the production of oils for tear film. Is LipiFlow Right for You? 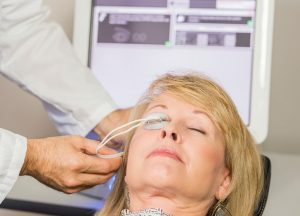 The LipiFlow treatment may not be right for your eyes. During an eye exam we can perform a series of evaluations to determine the root cause of your dry eye. We will use the non-invasive LipiView interferometer to assess your tear film and the Meibomian Gland EvaluatorTM to examine the quantity and quality of the oils. Our San Francisco dry eye doctors can perform the virtually painless LipiFlow treatment right in our office. Contact us today to schedule an eye exam to see if LipiFlow can provide relief for your dry eye symptoms.